SIOBHRA QUINLAN’s taken the long road to launching her first single, released earlier this month. She trained as an operatic soprano, studying an MPhil in composition at Trinity College and broadening her musical education in Berlin. That led – eventually – to a conceptual new composition that’s being self-funded by working with and teaching her art. Along the way, Quinlan was also a part of the highly successful Trinity College Orchestra, where she combined a more classical bent with reproductions of contemporary classics like Pink Floyd’s ‘The Dark Side Of The Moon’ and covers of Daft Punk and Arcade Fire. Stepping into her solo guise for the first time, Quinlan’s new output can be broadly described as chamber pop. Quinlan later branched into jazz and wrote a dissertation on how opera can be incorporated into different styles, before using a period of more casual training in Berlin to work on her style and explore the city’s expansive performance offerings. Naturally, Quinlan’s own writing takes in her broad influences, but also explores her own view of the world around her. As the first single reveals, she’s not afraid to make a statement. 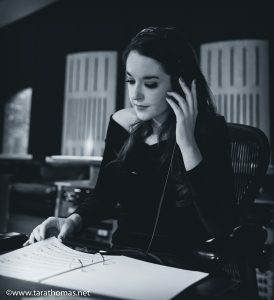 With the album – due later this year – still in the production process, Quinlan’s recorded her work alongside a group of musicians branded the SFiiiNX Sinfonia, an ensemble featuring members of the Trinity Orchestra, but also input from heady Dublin alt-rock band Spies. Getting everyone together in the studio has been a learning curve. With Quinlan already working with Ensemble, a kind of loose collective of a Dublin label, she’s alongside a highly respected group of musicians that fall outside of pop’s norms, yet are making waves. Siobhra Quinlan will debut new music from her forthcoming album at Fumbally Stables on March 30th. Tickets, priced at €10, are available via Eventbrite.